I had a mad idea. I had been asked by the Computers in Education Society of Ireland (CESI) to present a keynote speech with my good friend and colleague Elizabeth Oldham at the CESI conference on 10th March 2018 at Dublin City University. I told Elizabeth about my idea and suggested we dramatise disagreement from time to time in the speech and then ask the audience to settle our dispute. She agreed! 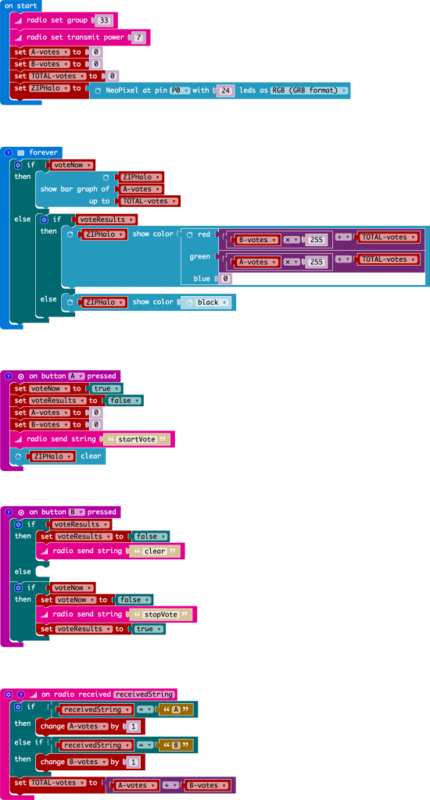 So, Keith started me off with a first go at a program for each Microbit. 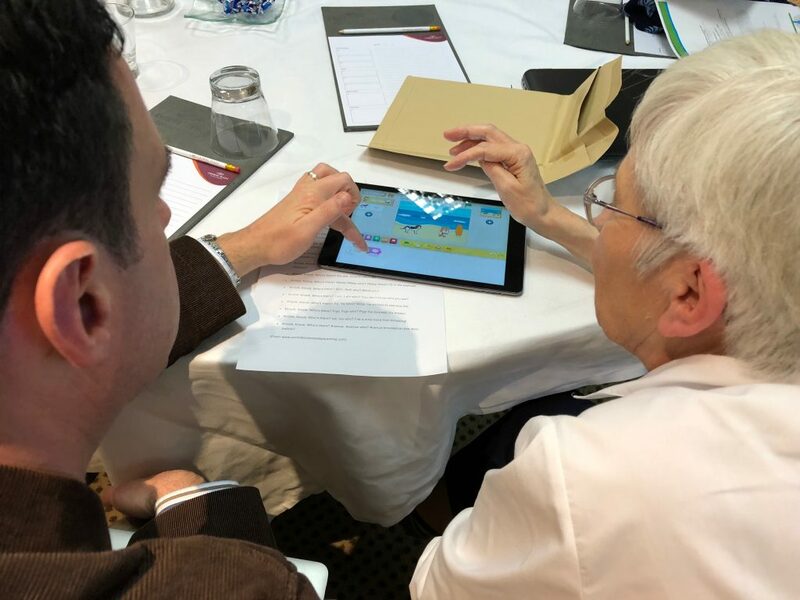 Then I tried at our CESI•CS meetings to get participants to try and solve the problem – they all came up trumps within only an hour or so, some with no experience at all – amazing! In each case, we discussed design processes, collaboration and the project work proposals in the Leaving Certificate for Computer Science. There were good discussions about foundations, progression and continuity, since all the CESI•CS meetings included primary and post-primary teachers. 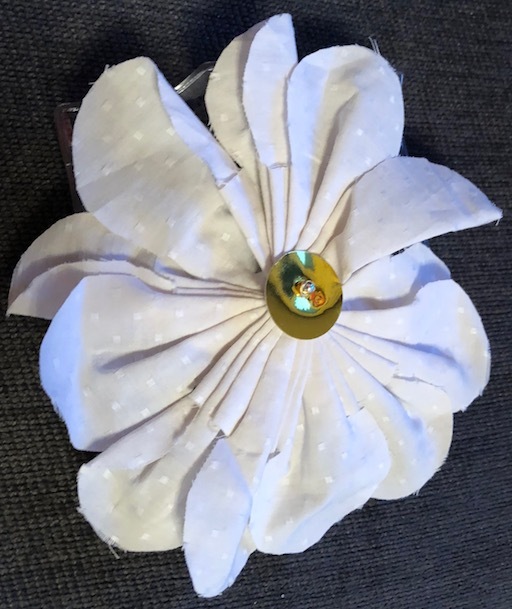 So, having established feasibility, I set about making something Elizabeth would be prepared to wear, so cut up an old shirt and got stitching and glueing according to this fabric flower design. 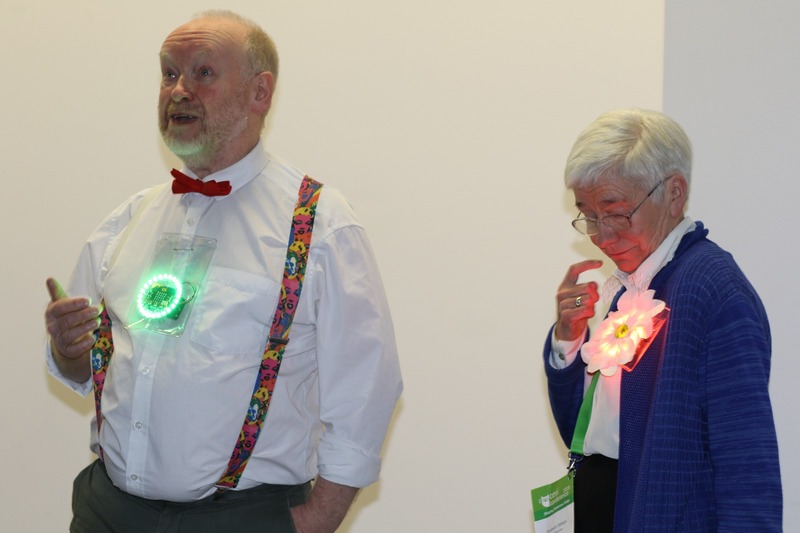 Behind her flower (and with no adornment on my wearable) was a Kitronix Zip Halo fixed to a Microbit, and with a safety pin provided by Adrienne Webb (thanks!) Elizabeth pinned it to her cardigan, and I mine to my shirt. The final task was to complete the programming. 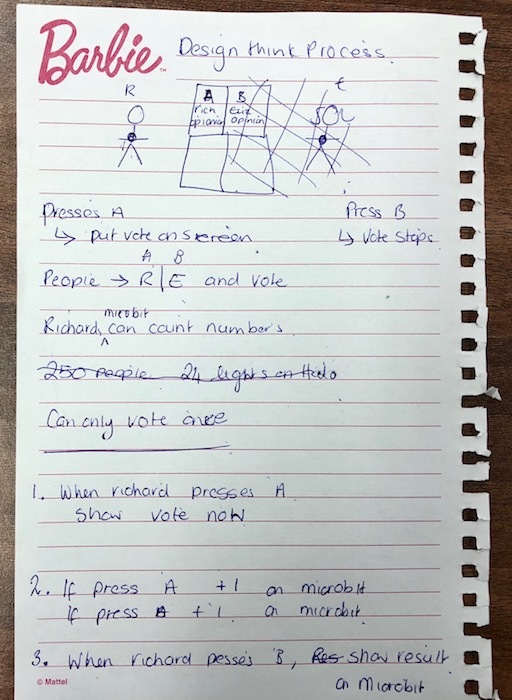 With Keith’s inspiration and the many design conversations and prototypes made by CESI•CS participants, I finally completed the code with two hours to spare – I only had time to test with three audience voting Microbits, so there was no certainty it would work. 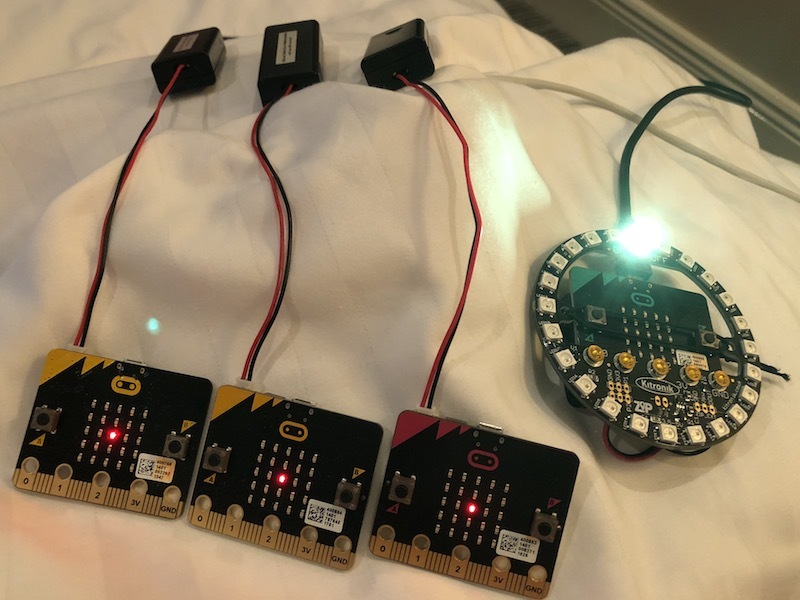 Once in the room and with minutes to spare, we set about downloading the audience program to a pile of Microbits generously lent to me by Stephen Howell of Microsoft. It couldn’t be done without the generous help of Stephen Howell, Keith Quille, Tony Riley and John Hegarty. We think we had over fifty voting in the room! I leave it to the reader to puzzle out how it all worked and will welcome suggestions for improvement! I recently worked with colleagues to offer similar workshops at two conferences – SCoTENS 2017 in Dundalk (with Pamela Cowan from Queens University Belfast and Elizabeth Oldham from Trinity College Dublin), Ireland and ATEE 2017 in Dubrovnik, Croatia (with Nina Bresnihan, Glenn Strong and Elizabeth Oldham, all from Trinity College Dublin). The workshops introduced our ideas about using a version of paired programming to give confidence to novices in programming. 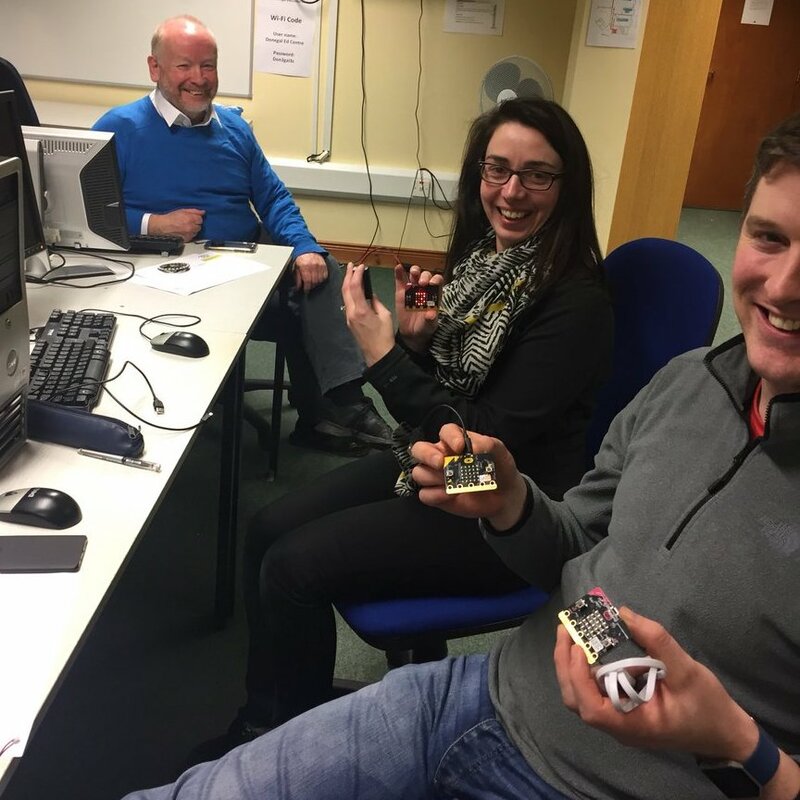 We had developed these ideas, together with colleagues Mags Amond and Lisa Hegarty, also from Trinity College Dublin, through the CTwins project funded by Google’s CS4HS – Computer Science for High School. The workshop slides for ATEE 2017 also included ‘Art’ in the title, since it was my notion that developing an art project would be personally fulfilling. 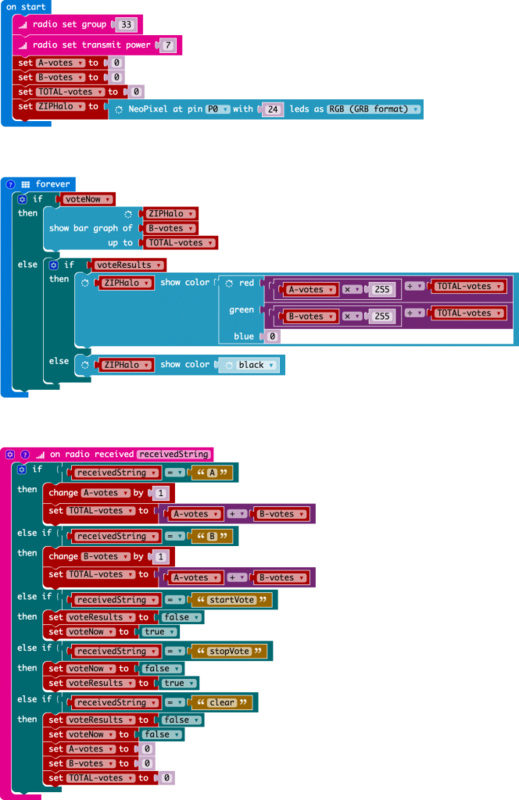 Nevertheless, I feel that as well as considering the tool design, we must also shift attention to the activity and mental models that I believe learners symbiotically develop alongside their use of the Scratch tool. The Logo programming language developed in 1967 and its turtle geometry microworld is one of the most potent developments to recognise such activity and mental modelling – although I believe not the earliest (I believe sentence generation using lists preceded it?). In the turtle geometry microworld, the computational object is a robot turtle on a stage, equipped with a pen to trace out lines as it moves according to program steps. Scratch starts with a different microworld sporting a cat rather than a turtle and is a particular kind of computer game with interacting sprites. It leaves in the jigsaw blocks for a turtle geometry microworld but they are somewhat spoiled by the sideways view of a stage rather than the top down view of the space that the turtle inhabits. 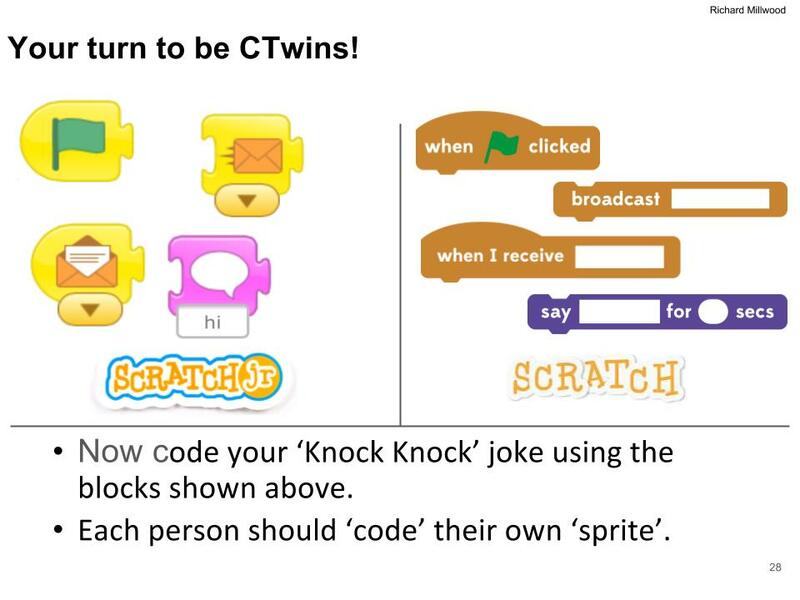 In the conference workshops we asked completely novice learners (adults using Scratch and ScratchJr) to program knock-knock jokes, with two sprites and message passing to synchronise the joke-telling activity. Ghost: No need to cry! Secondly, we asked the adults to humanly perform their own jokes working in pairs, so that one adult would be the first actor in the joke and the other the second. I was building on the concept of ‘body syntonic’ which is so powerful in the turtle geometry microworld, but in this case, it is the act of interactive joke telling that forms the mental model of the problem, to be then expressed formally in programming and debugged. In the Scratch turtle geometry microworld, the pen jigsaw blocks are the foundations of formally expressing the acts of an imagined turtle with its pen. Children (and adults) can ‘be’ the turtle and act out the actions either bodily or in their heads, exercising their mental model of the turtle, which may then help them debug their formal expressions in code (jigsaw blocks). In one instance of the workshop, to my delight, one learner added other blocks, using repetition to tell a more complex joke. So perhaps the set of immediately available jigsaw blocks should reflect the microworld the learner’s imagination and mental models are anticipated to inhabit? I would go further and propose microworld-appropriate stages (and stage views, as we have in Turtlestitch and Beetleblocks), sprites and costumes. In Turtlestitch I would propose a spider sprite/costume and indeed rename it Spiderart or some-such. Perhaps there should be a choice of microworld, “I’m doing turtle geometry today” which leads one to the set of jigsaw blocks most appropriate to that microworld? I emphatically do not mean that this means restricting access to the wider set of jigsaw blocks, simply that it provides the best recommendations from the menu for the kind of restaurant you want / are ready to eat in. To extend an already overworked metaphor, after the learner has been eating at diverse restaurants, each founded in the same underlying elements of heat, ingredients and combination, perhaps they would begin to strengthen their knowledge of the invariates which inform the mental models that underly their understanding of notional machine and programming language? I presented at the third annual Computing at School conference, reporting Nili Naveh’s research in a seminar I proposed to discuss the research into childrens’ conceptions in computing. The central issue is the contrast in the attention paid to children’s conceptual development in maths and science compared to computing. In maths and science, research has established a Piagetian analysis based on data of what percentage of children can achieve which conceptual understanding at a range of ages, and this is the basis for the National Curriculum levels. Clearly this should not be used as a straitjacket – there is a diversity in attainment and children are often underestimated. Teachers have excellent tacit knowledge of this, but I argued it may be helpful to articulate this more clearly and to construct a data-gathering exercise from schools across the country. We had a good discussion, thanks to some really good presentations earlier in the day which gave good fuel for our debate. Here are my slides: Algorithms + Data Structures = Programs. 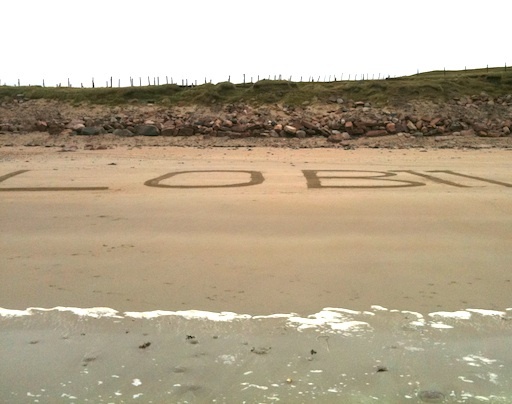 The second annual Learning on the Beach unconference #lob11 has just scattered – I am blown away, boiled, invigorated and inundated – and that was just the weather. 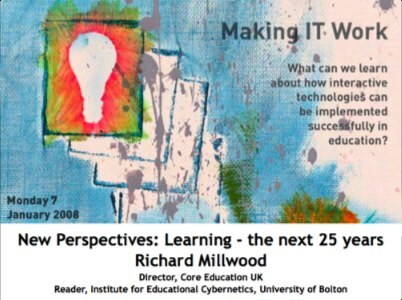 We were a self-select group of ‘old lobsters’ like me @richardmillwood and some fresh faces like @squiggle7 – the value of this mix in challenging the norms of indoor education was enormous. This enjoyable meeting to share research got me talking about the effort to build a National Archive of Educational Computing and the issues for research, practice and policy. The slides are here, although they were woven from a pretty odd set of threads! 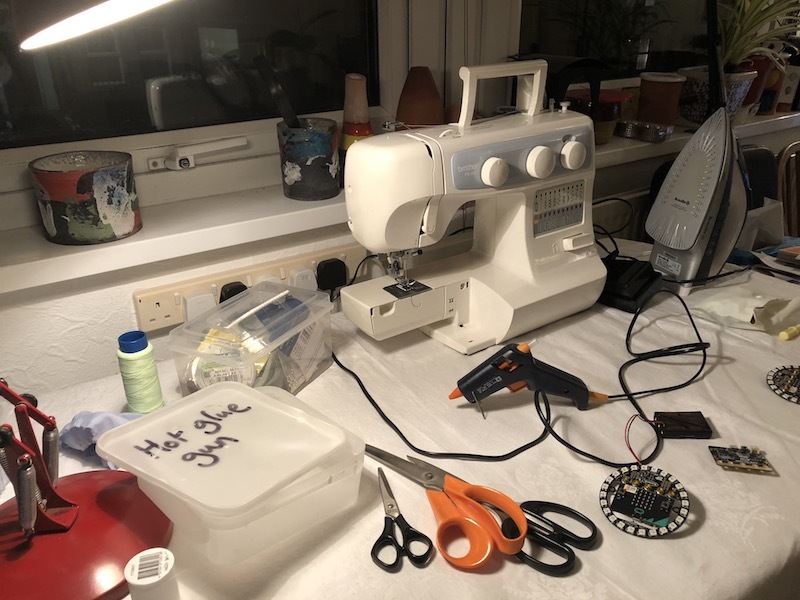 A real buzz of learner-centred excitement surrounds the reports of iPod projects presented here – especially the desire to create rather than simply consume resources. Interesting reports of large and small scale use including ESSA Academy’s 1 to 1 roll-out. Working with Friezland‘s Year 3 was a treat and reinforced what I learnt from listening to delegates, that iPod and App store had simplified the whole management issue so much that kids and teachers could take charge and feel empowered. More at the iPodTouchConf2010 Ning. 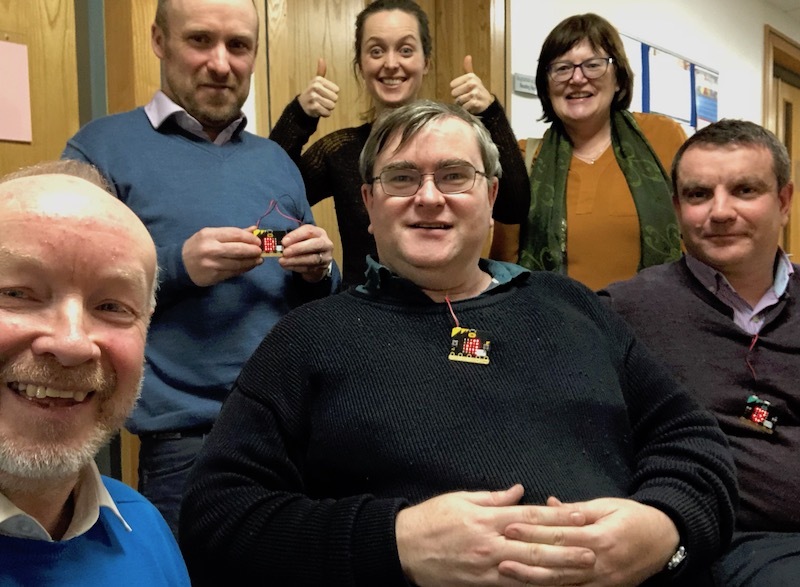 This TeachMeet was brave enough to throw the rules up in the air and try a new plan – and mostly it worked! I enjoyed the way the break-outs gave more intimate discussion and flexibility, but I missed the quickfire and serendipitous action of the random speaker. Most of all there was a mature relationship with commercial sponsors who were very much present, but respectfully supportive – thanks to all of them. There were great talks from Drew, Tom and Ollie and others I didn’t hear, but I also loved the Max’s ‘next thing coming’ talk with augmented reality, Blue Peter style. 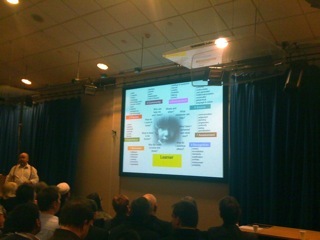 As ever with Teachmeet there was a mix of old-timers (I mean you Penny) and newcomers (Edith) and enthusiasm in buckets. I’d like feedback on this mind map. You can also download an A3 PDF poster of it. This conference is taking place on Wednesday with about 50 folk – I know many others would have liked to come, but this is only a start and there’ll be more. For those unable to be there, there will be plenty of reporting to come, and you can download the conference pack and archive leaflet right here. More importantly, if you have a story to contribute about your experiences with educational computing over the last four decades, contribute it in the stories section of the National Archive of Educational Computing website and if you want to do more, fill in the form in the support section. The JISC Regional Centre South West recorded and webcast my closing keynote to their conference using Adobe Connect and you can find the recording here. Thanks to Melanie Roberts at JISC RSC SW for managing the slides & chat and to her colleague who filmed and recorded sound so expertly. It was interesting to go back over the transcript from the four remote participants and see what worked (and not) for them – movies seem to be a bit of a problem, a shame since I had taken the trouble to transcribe and dynamically subtitle some of them using Quicktime text tracks – how does that get routed out to Adobe Connect? The Learning Through Enquiry Alliance conference at Sheffield University is a breath of fresh air – practitioner led, but research oriented, but above all a sense of camaraderie with many others struggling with the ideas we have been exploring for the last five years. A ‘world café’ exercise to break the ice led to my re-draft of an action inquiry model on the tablecloth, adding my latest concern for ‘feeling’ based on my interest in John Heron’s work. I have added a ‘FEEL’ aspect – feeling the need to improve, feelng curiosity which relate to Heron’s ideas of zest and interest around delight. 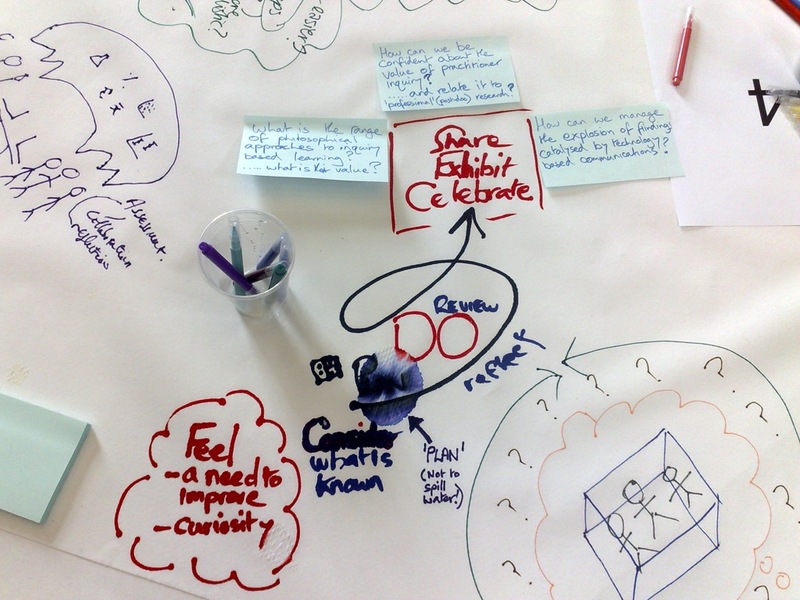 We have for a long time talked about exhibiton as a mode of assessment – I have clarified in this diagram by adding the word ‘celebrate’, that this is as important to feeling as it is to knowledge and communication. 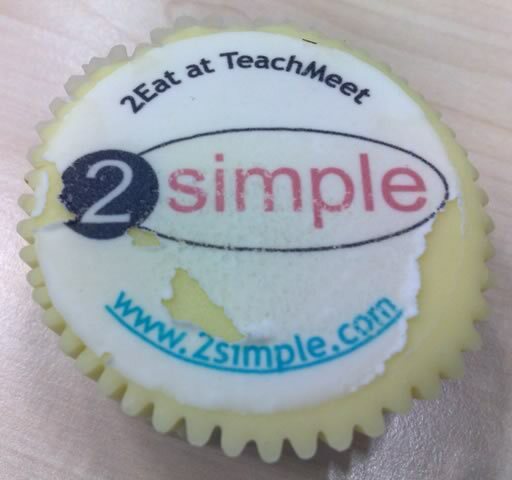 My first post about TeachMeet was a hurried blog in case Ewan offered a prize for the first person to Blog the event! More reflection, and waiting until the end, allows a more thoughtful blog which fills in some of the blanks. 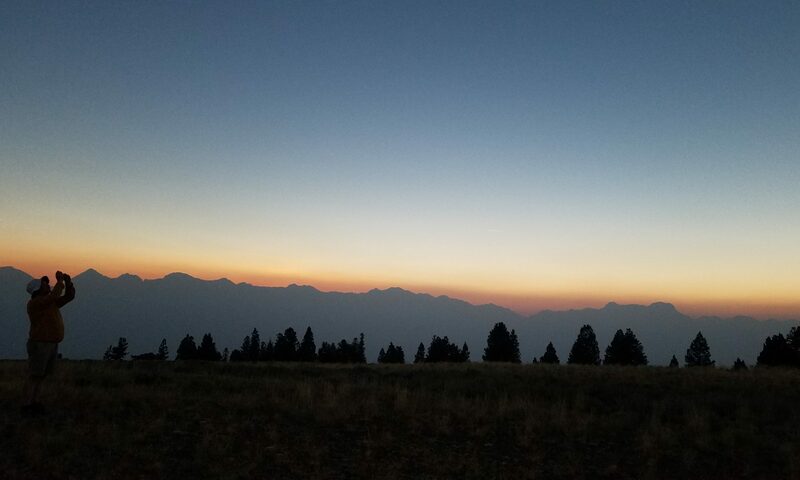 Blank 1 – why speak about delight? It was delightful to be able to speak about delight, and to discuss with colleagues in the breaks to ‘orient’ my thinking about this important topic. I feel the need to put some intellectual effort into a mantra, ‘delight is important in learning’, which I have been chanting uncritically for over fifteen years. I believe delight is one of the sources of motivation, perseverance and retention which softens the pain of the ‘hard yards’ in learning. I believe delight (and more generally fulfilment) is an entitlement for learners, as they learn, not when they pass exams. 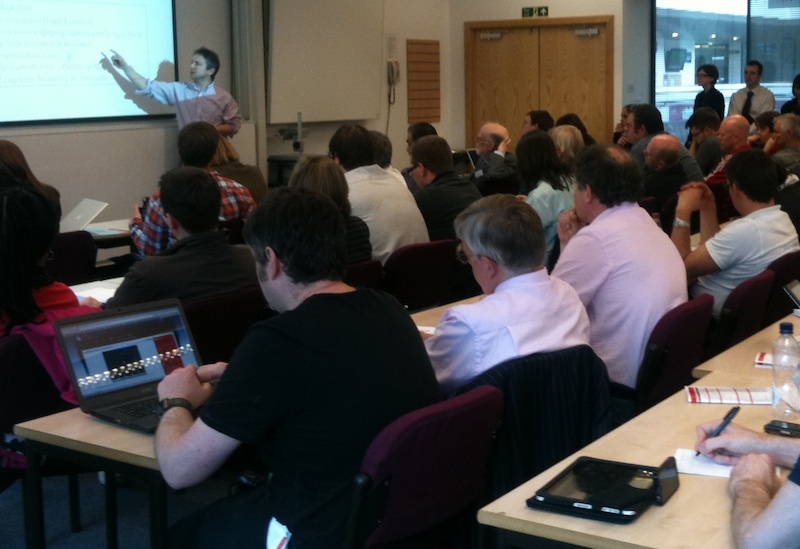 Blank 2 – what a stonking set of presentations! I failed to mention the wealth of speakers and the high quality of their ideas and practices on parade. 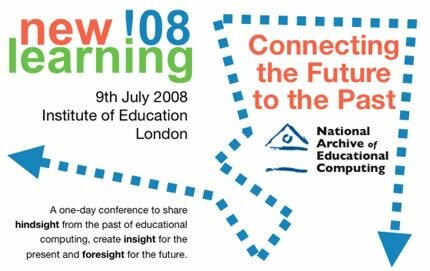 Egocentrically, and only after Drew Buddie had pointed it out, I was struck by the chickens coming home to roost from Ultralab‘s and Apple Teacher Institute work in the early ‘noughties’, such as movie making and stop-motion animations around social and serious issues. More moving were the confident presentations from folk like Sarah Hackett on using Moodle to teach folk fiddle and Tom Whitehead on animal shape poetry workshops, both researchers from Ultraversity, these along with many others were inspiring. I had volunteered to be the meeting end of an online video-conference for those who couldn’t be arsed couldn’t get to Redbridge. 🙂 Thanks to David Noble, Anthony Evans and Nic Hughes for making it all so easy. It seemed to work well, using FlashMeeting and connecting my Apple MacBook Pro to a Canon digital video camera with a firewire cable and using a directional microphone to get the best quality – I rely on reports from participants as to whether this was effective and I apologise now for the time through the break when I went to get a beer and got cornered in the bar – I came back to find the camera pointing at the ceiling! I only regret not carrying through my original plan to use a second data projector so that the audience in the building could see the participants out there and perhaps respond to their questions and comments. Next time. 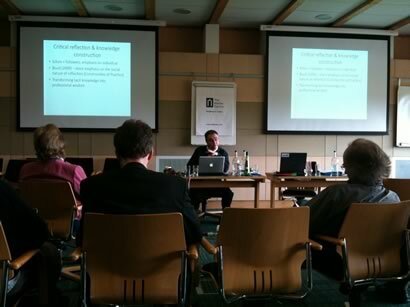 I have been speaking on the issues surrounding Social Software in learning here at the Heads of eLearning Forum meeting in Coventry. The participants in Learning@School have brought so many laptops it broke the wireless! 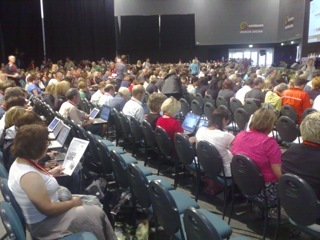 I am here in New Zealand with Patrick to present at this massive teachers’ conference organised by Core Education. 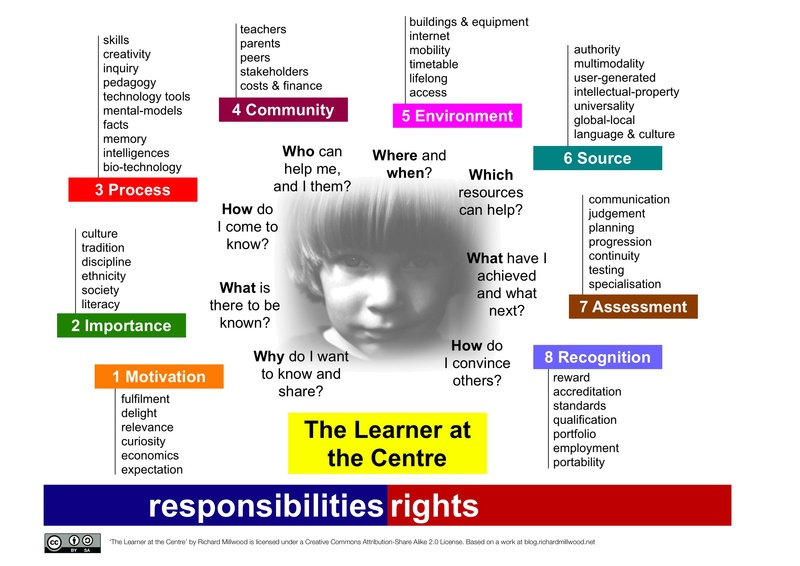 I have two workshops on ‘Delight in Learning’ and a keynote to present on ‘Learners at the Centre’ at the end. In fact I have just finished the first workshop and learnt some really useful ideas of how delight happens in learning, which will be reported on the conference web site (I will edit this post then to include a link). 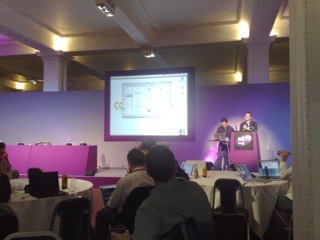 Here at TeachMeet enjoying the liveliest set of presentations and most enjoyable debate – more fun than the rest of BETT put together.